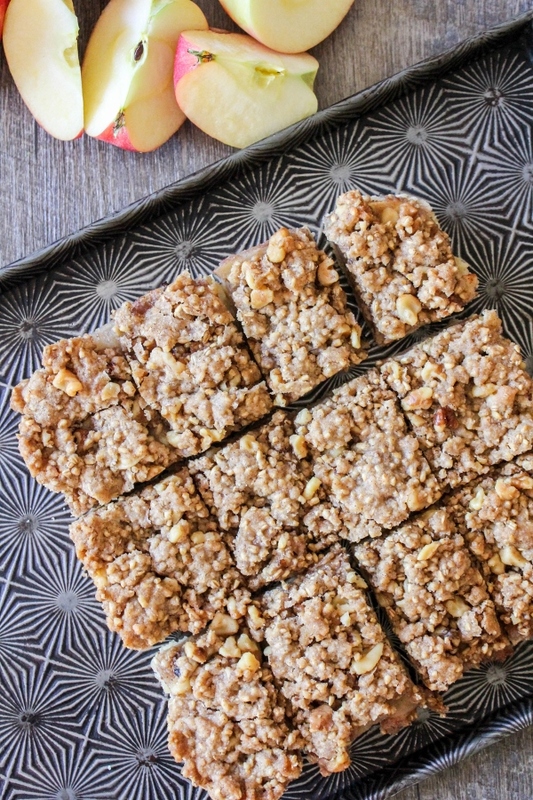 These Apple Walnut Bars are addicting and so easy to make! A sweet apple filling is layered between a shortbread crust and a crunchy topping, making them a hit with everyone! A special thank you to Rainier Fruit, Flahavan's Oats, and all of our amazing sponsors for sponsoring this post and our #AppleWeek giveaway! I couldn't let #AppleWeek go by without sharing one of my favorite apple desserts! 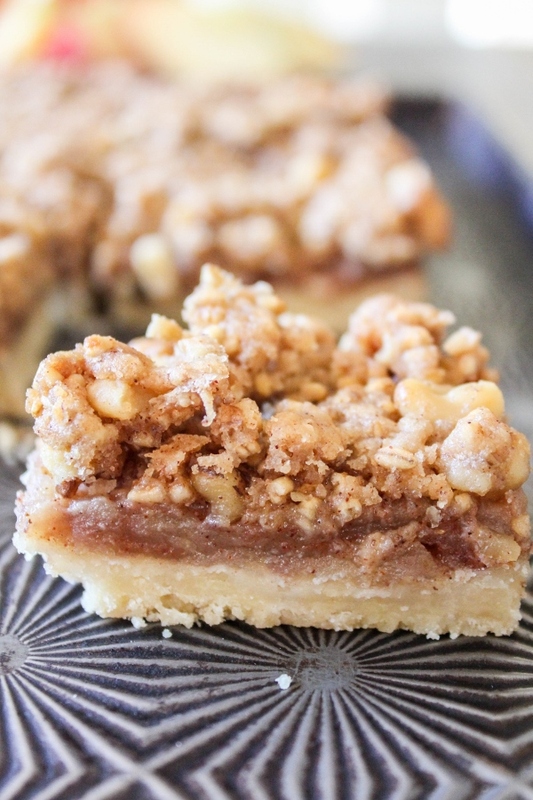 These Apple Walnut Crumb Bars are easy to make, full of flavor, and totally irresistible. They are perfect for taking to a tailgate or fall party, but even better when made just for the family. You probably should share them though because I guarantee you can't eat just one! 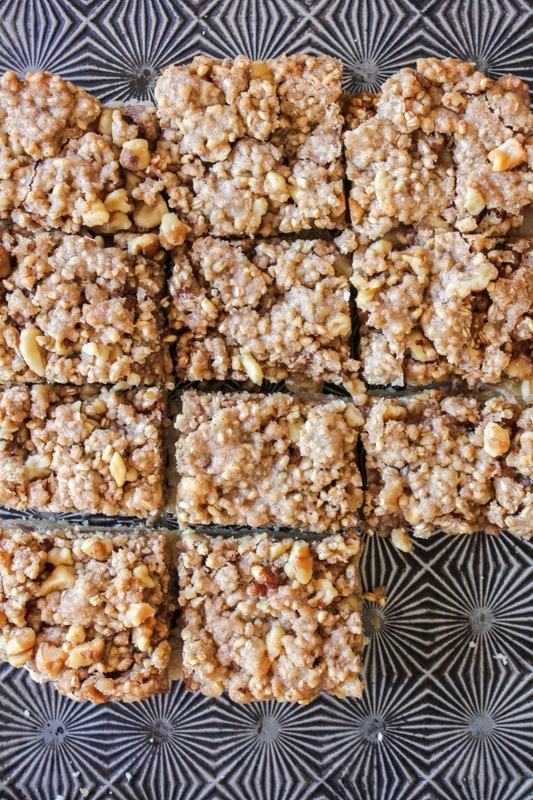 These bars have a simple shortbread type crust, a juicy apple packed filling, and a walnut and oat topping that adds the perfect crunch. I mean it when I say these are SO. GOOD. 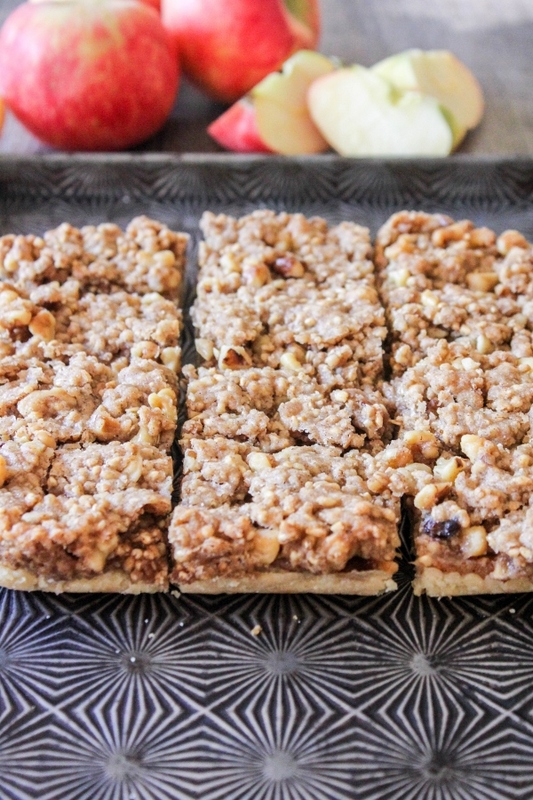 If you love apple pie then you will definitely love these bars. They are filled with all the same flavors, but much easier to make. Be sure to scroll down to fine more delicious apple recipes, and don't forget to enter our awesome giveaway! Preheat the oven to 350 degrees. Line an 8-inch square baking pan with parchment paper, making sure to leave an overhang on two sides to easily remove the bars from the pan. To make the crust, whisk together the melted butter, sugar, vanilla, and salt together in a medium bowl. Add the flour and stir until combined. Press the mixture evenly into the prepared baking pan. Bake the crust for 10 minutes. While the crust is baking, prepare the filling. Toss the apple slices with the flour, sugar, and cinnamon until the apples are evenly coated. Set aside. To make the topping, stir the oats, walnuts, sugar, cinnamon, and flour together in a medium bowl. Cut in the chilled butter with a pastry blender or two forks unil the mixture resembles coarse crumbs. Set aside. Carefully remove the crust from the oven and evenly layer the apples on top of the warm crust. Gently press them down to fit in the pan. Sprinkle the apple layer with the topping and bake for 30 minutes, or until the bars are a light golden brown. Remove from the oven and allow to cool in the pan for at least 20 minutes. Using the parchment overhang, remove the bars from the pan and allow to cool completely. Once cool, cut into 12 bars and serve.